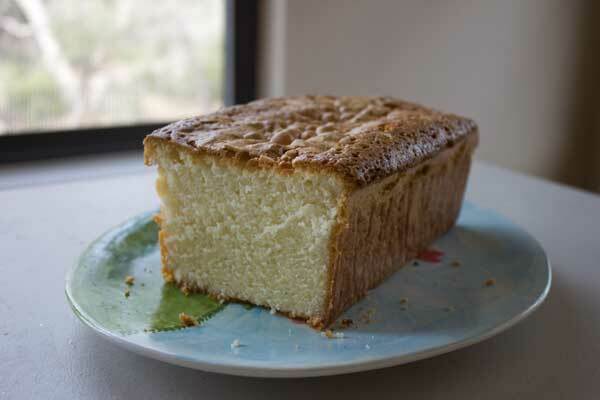 Not that you need an excuse, but it’s National Pound Cake Day so bake a pound cake! That is, if you like pound cake. It’s actually not my favorite type of cake, but it’s a good complement to the berries that have been on sale lately. That, plus I’ve been searching for top pound cakes and wanted to try the highly regarded Elvis Presley’s Favorite before I’d forgotten the flavor and texture of my favorite Perfect Pound Cake with Cream Cheese. The only change I made to the recipe on Epicurious was to halve it and bake it in an 8 1/2 by 4 1/2 inch loaf pan. To halve seven eggs, I used 3 eggs plus 1 yolk. The cake smelled a little eggy when I took it out of the oven, but it didn’t taste too eggy once it had cooled. It was less dense and heavy than some of my other pound cakes and not as tight crumbed. It also seemed really sweet — not that being sweet is a bad thing, but it just seemed a tad bit sweeter than others. Maybe that’s why Elvis liked it? I don’t know. It’s definitely a very good cake, but I like the other one better. Grease and flour a 10 inch tube pan or a large Bundt pan. Sift the already-sifted flour 3 times total, then stir in the salt. With an electric mixer, beat the butter and sugar until light and creamy, scraping bowl often. Do this for about 5 minutes. Add eggs 1 at a time, beating for 30 seconds after each addition, then beat in vanilla. Using the lowest speed of the mixer or if you prefer, by hand using a scraper, add half of flour, then all of cream, then remaining flour, mixing well after each addition. When batter is smooth and satin-y, pour batter into pan. Drop pan from about 2 inches onto the counter to remove air bubbles. Place pan in (cold) oven and turn oven temperature to 350°F. Bake for 1 to 1 1/4 hours or until golden. I actually love pound cake, but have an issue with ones that are two sweet. I like the look of that crumb, though. I must say the texture improved quite a bit after it sat around for a while. It’s tight crumbed (guess it’s settled?) and I had fun cutting it into perfect little cubes. It is sweet, though. Glad it wasn’t too eggy after it cooled. This is a new one for me. Thanks! Yes, I think it’s because Elvis liked sugar. And the pound cake really is good. Glad it turned out, despite your fears! Perhaps it needs some peanut butter, banana and bacon! Remember, Elvis was a Southern Boy and probably like his food sweet!